Hi, my name is Gabor. I've been serving the expat community with laundry and dry cleaning for the last 25 years. If you are a student or performing temporary duty I have a special offer for you. Staying in a hotel? You will save lot of money using my service instead of the hotel's. I think you'll agree that our shirts are the best in town. All of our shirts are laundered on premises - nothing is sent out. Your shirt will come back to you meticulously hand finished and presented neatly folded or on a hanger (your choice). The whites will be white and the colors will be bright. 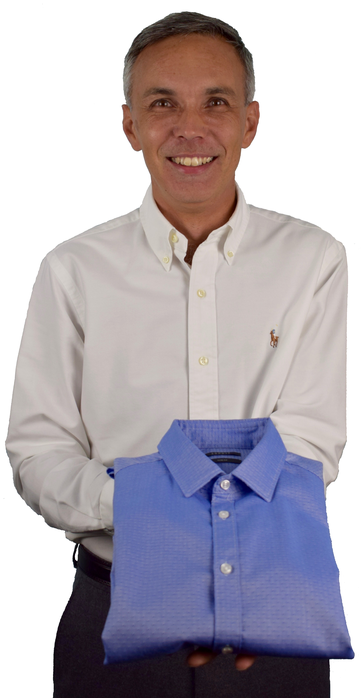 Each shirt is carefully inspected to make sure collars and cuffs are neat and crisp. Cracked or missing buttons are replaced free of charge. If you are not satisfied with the quality of our cleaning for any reason, we will re-process your garment at no additional charge. It's easy to do business with me. Call +36 30 966 5480, text me (I use iMessage, Viber and WhatsApp with this phone number) or subscribe here and have me pick up your laundry or dry cleaning. I offer free pickup and delivery from Monday to Friday. Payment cash on delivery or PayPal. Big note is never a problem for me, I will have the change and always provide you a detailed receipt. Minimum order apply, at least 6000Ft. Price includes cleaning/washing, pressing/ironing, packaging and delivery. Discount on "pressing only" (except shirt!) and child clothing. Pricelist is valid in 2019.